Visit the colorful Flower Fields in Carlsbad California. 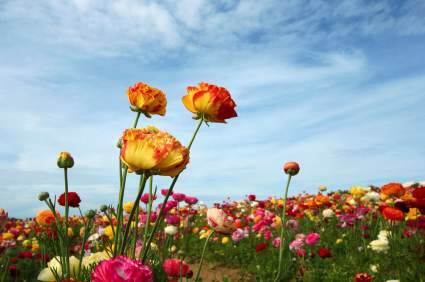 The Carlsbad Flower Fields offer a spectacular display of Ranunculus flowering bulbs that bloom from early March to early May. This season it is early March 1 through May 12 2019 (Mother's Day). 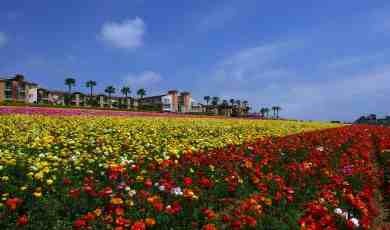 The Flower Fields at Carlsbad Ranch are nestled on a hillside between the Carlsbad Premium Outlets, a wonderful outdoor shopping mall, and Legoland California. This annual burst of color at the Flower Fields in Carlsbad is a favorite sight for locals in San Diego North County, welcoming the arrival of spring here in Southern California. The flowers are arranged in spectacular displays, such as a large American flag or a quilt of spring colors. You can view them from the road for free, or pay to take a walking tour for a close view. Be sure to bring your camera to get some great photos. A gift shop is available to purchase fresh cut flowers, bulbs and potted plants. The best time to visit depends on the rain and bloom, but since they stagger planting some fields, so there is always a good show. Also consider visiting during one of the Flower Field special events, but come early to beat the crowds! 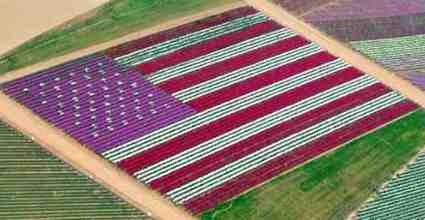 This American Flag is flowers at the Carlsbad Flower Fields. 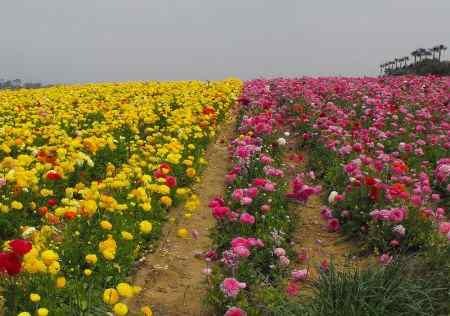 Carlsbad Flower Fields is a flower ranch in Carlsbad, Cal, that grows Tecolote Giant Ranunculus, a buttercup flower. Each year they harvest 6 - 8 million bulbs to sell, which means in the springtime, Carlsbad and visitors to this northern San Diego county ranch get to enjoy the spectacular flower show. Operating Hours: Open daily from 9 - 6 during spring season - March 1 through Mothers Day weekend May 12 2019. Ticket Prices: $18.00 adults, Senior 60+ $16.00, children 3 - 10 $9.00, 2 and under free. Discounts of $1 for AAA members. Wagon rides area available for an additional fee. Season passes available $39.00 adults, Senior 60+ $34.00, children 3 - 10 $20.00. Discount Tickets and Coupons: The free North County Sun newspaper may have buy one get one free coupon for up to 6 admissions for the 2019 season. Food: Bring a picnic lunch, or visit one of the nearby restaurants for lunch (Karl Strauss Brewery, Canyons Restaurant at the Carlsbad Golf Course), Rubio's Fresh Mex Mexican Restaurant at the outlet mall next door. No alcohol allowed on premises. Nearby Attractions: Carlsbad Premium Outlet Shopping Mall, Legoland California, Sea Life Aquarium , and Carlsbad beaches. Handicap Access - Limited handicap parking. Pathway along the bottom accommodates wheelchairs and offers great views and access to some additional gardens. Official website for The Flower Fields at Carlsbad: www.theflowerfields.com. Bill Magee Blues Day - Saturday March 30 2019 Free concert with paid admission. Arts and Crafts Celebration - weekends March 23 - 24, March 30 31, April 6 - 7, April 13 - 14, Apr 20 - 21, and Apr 27 - 28 2019. Local artists will show their painting, crafts and photography. Kid’s Day at the Flower Fields - Sunday March 23 2019. Kids Days offers fun activities and entertainment for kids and families. Blues Day - Sunday March 31 2019. Free concert with paid admission. Tea in the Garden - March 31 and may 5 from 11 AM to 1 PM. Reserve your spot. Tickets are limited. Girl Scout Day - March 16, March 23, and April 27 2019. Earn your Flowers Field badge. Advance reservations required. Mother’s Day Celebration at the Flower Fields - May 12 2019 from 9 AM to 6 PM. Visit the spectacular 50 acres of Flower Fields overlooking the Carlsbad, California coastline on this special day – Mother’s Day. For more information about Mothers Day at Flower Fields in Carlsbad see www.theflowerfields.com. Note: There are additional events on their website event calendar. Directions from San Diego to Carlsbad Flower Fields - North on Interstate 5 to Carlsbad, east on Palomar Airport Road. Go one block to Paseo Del Norte and turn left. Make an immediate right into the Flower Field parking lot. Directions from Inland Empire and East San Diego County to Carlsbad Flower Field - Take Interstate 15 to Highway 78 West, go south on Interstate 5, then east on Palomar Airport Road. Turn left on Paseo Del Norte and an immediate right into the parking lot. Directions from Los Angeles and Orange County to Flower Fields Carlsbad - Head south on Interstate 5 to Palomar Airport Road exit. Turn east on Palomar Airport Road, left on Paseo Del Norte, and make an immediate right into the parking lot.